Bill Nye - Water Cycle video click here. National Weather Service then click "Get Detailed Info"
Weather is short term variations(changes) in the atmosphere. A person who studies the weather is a meteorologist. Today the word meteor means a large chunk of rock from space, but it used to mean anything that fell from the sky (rain, snow, hail, sleet, etc.). There are four main factors that effect the weather: temperature, humidity, air pressure, and wind. The study of weather is meteorology (-logy means "study of") and a person who studies weather is a meteorologist. Weather is caused by the uneven heating of Earth's surface. Areas near the equator receive more energy from the Sun than areas near the poles. Warm air near the equator rises, causing cooler air to rush in to fill the space. This warm air rising, cool air sinking, and cool air rushing into fill the space left by the warm air is called a convection current. In the picture to the left it's called a circulation cell. Same thing. ​The movement of air across the surface of Earth is called wind. Convection currents move heat from the equator towards the poles. Without convection currents moving heat around the Earth, the equator would be much hotter and the poles would be much colder. Temperature is a measurement of the kinetic energy of atoms. Basically, that means "how fast the atoms are moving." All atoms are in motion. In a solid, atoms are stationary, but vibrating. In a liquid, atoms are touching, but they can freely move past each other. In a gas, atoms are far apart and moving very fast. Relative humidity is a measure of how much water vapor is in the air compared to how much it could hold. 100% humidity means that the air is full and can't hold any more water vapor. Hot air can hold more water vapor than cold air, because in hot air the air molecules are farther apart. To help us understand relative humidity, let's use an example. Let's use liquid water instead of water vapor and different beaker sizes instead of temperature. If you fill each of the beakers above with 150ml of water, the middle beaker (cold air) will be 100% full, while the beaker on the right (warm air) will be about 60% full, and the beaker on the left (hot air) will only be about 19% full. So a hot day with 100% relative humidity has a lot more water vapor in the air than a cold day with 100% humidity. Absolute humidity is a measure of how much actual water vapor is in the air. For example, if you fill each of the beakers above with 150ml of water, they will each have the same amount of water. 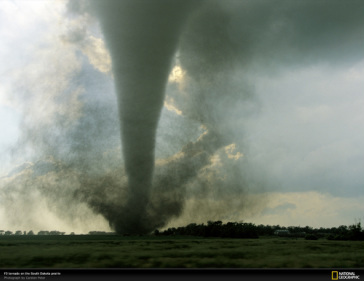 A Tornado is a violently rotating column of air that extends from a thunderstorm to the ground. Tornadoes happen on land and should not be confused with hurricanes which are much larger and happen at sea. Tornadoes form from the collision between two differing air masses, cold&dry meeting warm&moist. Only a few countries experience tornadoes, but most happen in the United States. Every state in the USA has been hit by a tornado, but a few states see a large number of them every year. Surprisingly, it's actually the state of Florida that experiences the most tornadoes, though Florida tornadoes rarely reach the strength of those seen in the midwest states. Tornado Alley is a relatively flat area of the United States between the Rocky Mountains in the west and the Appalachian Mountains in the East. There are several states in Tornado Alley that frequently see tornadoes; however, Texas, Oklahoma, and Kansas experience the most. The location of this flat area of land is perfectly situated between cold/dry air that moves south from Canada and warm/moist air that moves north from the Caribbean and the Gulf of Mexico. Meteorologists measure the strength of a tornado using the Fujita Scale. Named after Ted Fujita, a Japanese-American scientist who studied severe storms, the Fujita Scale measures how much damage a tornado can do, from F0-F5, F0 being the weakest and F5 being the strongest. For an animation on the damage caused by different strength tornadoes click here. Climate is the average weather over a long period of time (years, decades, or even centuries!). 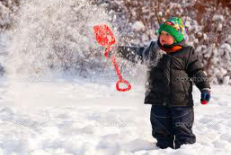 The two main factors when determining climate are temperature and precipitation (rain/snow). Areas near the equator generally have hot and rainy climates. Deserts are hot and dry, while rain-forests are hot and rainy. The state of Washington in the northwest U.S. is cold and rainy while Antarctica is cold and dry. The weather on any given day can vary a bit, but the overall average weather (climate) stays the same over long periods of time. Climate graphs give information about both temperature and precipitation for a location all on the same graph. There is a line graph part and a bar graph part. The line tells you the temperature for each month while the bars tell you the precipitation for each month. Check out the climate graph to the left. For September, the average temperature is 14 degrees Celcius, while the average rainfall is a little less than 60 millimeters. To go to the interactive world climate map click here. To go to the ClassZone website for weather animations click here. On a global scale, convection cells would normally just move warm air towards the poles. However, because the Earth is spinning, the winds get deflected from their normal straight path. In the Northern Hemisphere, winds curve to the right, while in the Southern Hemisphere, winds curve to the left. This is called the Coriolis Effect. For an animation on the Coriolis Effect click here. For an interactive animation of the Water Cycle click here. For reasons that aren't totally understood, the Earth has several convection cells. Generally, though, warmer air rises at the equator and also at both 60 degrees North and 60 degrees South. Meanwhile, cooler air is sinking at both 30 degrees and 90 degrees north and south of the equator. At 30 and 60 degrees (North or South), air is either rising or falling, so it's not moving across the surface. This means there is very little wind at these latitudes (often called the "doldrums" or "horse latitudes"). Early sailors had to be very aware of these wind patterns and steer clear of the doldrums. No wind meant your ship didn't move, which meant you could sit for days, maybe even weeks in one spot and possibly run out of food. Sailors from Europe (about 52 degrees North) preferred to sail south to the Trade-winds, take them West to reach the Carribean and then sail north to the Americas, then take the Easterlies to get back to Europe. When two different air masses collide, meteorologists call the line where they meet a "front." There are a few different kinds of fronts, but here are the two most basic ones. Cold fronts happen when a cold air mass runs into a warm air mass. Since cold air is more dense, the cold air mass pushes the warm air mass up pretty quickly. If there's a lot of moisture in the air, large cumulus or cumulonimbus clouds can form and thunderstorms can happen. For an animation on Weather Fronts click here. Warm fronts happen when a warm air mass runs into a cold air mass. Since warm air is less dense, it must go over top of the cold air mass. As it fights its way over the top it tends to flatten out the cold air mass a bit. If there's a lot of moisture in the air this can form several different cloud types. It may rain for long periods of time like all day or for several days, but you usually won't get thunderstorms. Land heats up and cools down faster than water. This can have big effects on local weather. One of those effects is land and sea breezes. Remember: warmer air rises (it's less dense) and cooler air sinks (it's more dense). Whenever warmer air rises, cooler air must rush in to fill the space. We call this rush of air over Earth's surface a "wind" or a "breeze." Land heats up during the day by absorbing energy from the Sun (radiation). The land then heats up the air that's touching the surface (conduction). That air is now warm and begins to rise. The ocean heats up slowly, so during the day it is cooler than the land. Because the ocean is cool, the air at it's surface will also be cool. As the warm air over the land rises, the cooler ocean air must rush in to fill the space. This is a sea breeze. If you've ever been to the beach on a really hot day, you've probably experienced and appreciated a cool sea breeze. At night there is no radiation from the Sun to warm up the land so the land cools down very quickly. Meanwhile, the ocean has spent all day warming slowly up and is now at it's warmest. The ocean begins to warm the air at it's surface (conduction) and this air begins to rise. As the warm air over the ocean rises, the cooler land air must rush in to fill the space. This is a land breeze. You may recognize the pattern of warm air rising, cooler air rushing in to take it's place as being part of the convection cycle! Check out a land/sea breeze animation here.